This event is organized by Care Epilepsy Ethiopia and Epsa iom. In support of ongoing fundraising, both Charities are combining to offer an opportunity for Trek enthusiasts in the Island to experience the superb landscape and wilderness of the Simien Mountains of Ethiopia. The specially designed itinerary will take you through stunning mountain scenery, remote villages and abundant wildlife in the Simien Mountains National Park. Our ultimate goal is the summit of Ras Dashen, the highest peak in Ethiopia (4,620m) and the fourth highest in Africa. The trip will also include time in Lalibela, to visit the UNESCO World Heritage-listed rock-hewn Churches (known as the ‘8th Wonder of the World’) and in Gondar (‘Africa’s Camelot’) to tour its Castles. 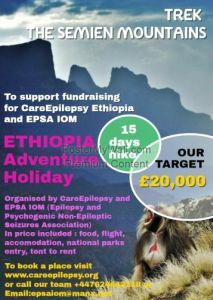 Turn your marathon into a fundraising event and collect donations for CareEpilepsy Ethiopia. 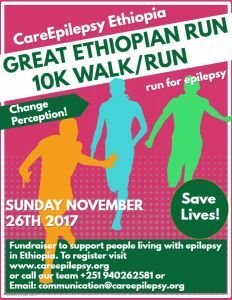 Running for CareEpilepsy Ethiopia gives you the opportunity to save the lives of people with epilepsy and change perception about epilepsy in Ethiopia. The Second National Epilepsy Week (13th June -17th June 2017) was celebrated in Mizan Aman Town. Our motto for 2017 National Epilepsy Week was “Through medical care, you can live a productive life with Epilepsy”. This event raised awareness and educates the public about epilepsy. Mizan Tepi University was our Gold Sponsor of the Event. 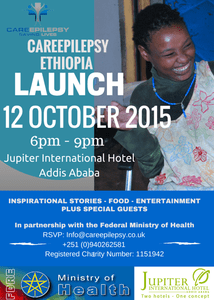 CareEpilepsy Ethiopia was officially launched in Addis Ababa, Ethiopia on Monday 12th October (5-8pm) at Jupiter International Hotel-Bole, Addis Ababa. The event received good press coverage. The launch of this ground-breaking initiative will initiate a high profile campaign to raise awareness about epilepsy in Ethiopia. “Youth for Epilepsy Ethiopia” team is a group of youth volunteer service who aspire to full participation in the life of people with epilepsy and have committed to eradicating the stigma of epilepsy from Ethiopia. Below, our Youth volunteers explaining the plight of people with epilepsy during our launch event. Rimbo, Sweden: 2015 A collection after Enat’s presentation in Sweden raised £76. Chelsea, London: November 2013 Wine and cheese party held in Chelsea, London. We raised £570. November 2012 Ethiopian meal in the Advent Centre, Central London, with an attendance of about 90. 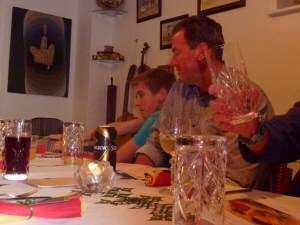 We raised £1,010 after expenses. We had Dr. Heather Angus-Leppan, Consultant Neurologist, Royal Free London NHS Foundation Trust and Dr. Martin Prevett, Consultant Neurologist at Southampton NHS Trust as our guest speaker. 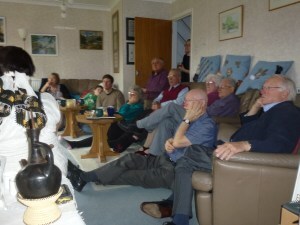 Sept 21 – Oct 2013 – Three separate Ethiopian meals in Abbots Langley, Herts and raised £1,655.